BBC Worldwide took a brave step in changing venues for its annual Showcase after 25 years. When an annual event has been held at the same destination and venue for 25 years, relocating it some 250 miles away is a pretty big deal. Obviously working somewhere new throws up logistical challenges, but there are also delegate anxieties to deal with. And when delegates are essentially paying to attend, it is crucial to get them on board. These are the challenges that BBC Worldwide, the commercial arm of the BBC, faced with its BBC Worldwide Showcase 2012 event, which was held at the ACC Liverpool for the first time last month after a 25-year tenure at The Brighton Centre. After a lengthy pitch process, which saw Liverpool shortlisted against the incumbent, Manchester and Harrogate, BBC Worldwide signed a five-year contract with ACC Liverpool. The flagship event acts as a platform for the BBC to showcase and sell programmes and formats produced by the BBC and independent producers to TV buyers from around the world; it accounts for around 20 per cent of BBC Worldwide's annual programme sales. C&IT took a tour behind the scenes at the event and spoke to some of the key parties involved to find out how the move had gone, and what steps were taken to ensure the event not only matched, but surpassed previous Showcase events. Sally Brookes, BBC Worldwide head of events, says moving to the ACC has been a learning process for all parties: "We've been educating each other. Being here means we can create more impact with our evening events, and double the room height. The extra height makes so much difference: we can really bring the programmes to life." Brookes and her team spent a long time looking for the right venue and destination to move the Showcase to. "Very few spaces would work, so we were limited to purpose-built centres, but we didn't want to lose the exclusivity and spirit of the event that had built up in Brighton," she says. "The event is free, but our buyers pay for their travel and accommodation, so we had to find a range of hotels to meet different budgets." 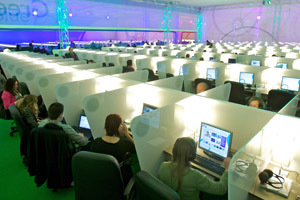 She says the ACC worked because of its contemporary look and feel, and its state-of-the-art equipment allowed evening events to be held in the same place, while enabling the BBC to do things differently and refresh the event. 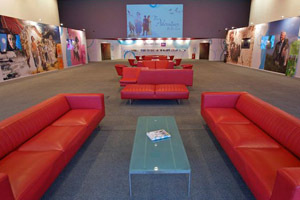 Naturally one of the biggest concerns for the BBC was making sure delegates were on board with the move to a new destination. Clare Vincent, vice-president, marketing worldwide sales and distribution, at BBC Worldwide, said communication was key. "We have taken delegates on the journey with us every step of the way. There has been a dedicated helpline and we have communicated to them every month, sending them teasers," she explains. While it is too early to get in-depth post-event analysis, Brookes says delegate feedback had been very positive, and the fact that a record 640 buyers attended is a good sign. ACC Liverpool's relationship with BBC Worldwide goes back several years. Director of sales Kerrin Macphie and a core team including senior event manager Darren Neal worked on ACC's bid for the event and, once on board, regularly met the BBC and its production suppliers. The main challenges, he says, were convincing the client that the destination had the right infrastructure to support the event, and that from a venue perspective, the space could work "as well as, or better than, Brighton". 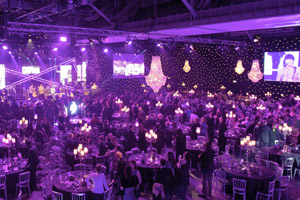 As well as the viewing area for the 600 Digibooths, one part of the hall had to be altered daily for the gala dinners. BBC Worldwide decided to build a mezzanine floor for hosting drinks receptions overlooking the dinner area - the first time one had been constructed. "This was one of the most complex set-ups we have had," recalls Neal. "As well as the BBC team, we worked with its two production companies, so it was like three clients on three events. There was a six-day build period, when 250 contractors were trying to get into the venue to get their bit done. We also had to make sure we had the power and technical capability for the 600 booths, and invested £45,000 in upgrading the VLAN so we had enough bandwidth." Although the ACC team led the BBC event bid, the city's Convention Bureau also played an important role. Bureau manager Carol O'Reilly says: "We suggested hotels and got the rates for the tender document and also compiled tour options for delegates arriving early." The bureau also helped ACC produce posters and collateral at Lime Street Station, and flags on site. But O'Reilly says one of the focuses for Liverpool was making sure delegates had a good experience and received a warm welcome so they would come back to the Showcase event. "Kerrin (Macphie) and I went round to meet all the GMs of the hotels hosting delegates before the event to make sure their staff were geared up for it. As it's the first one we have hosted as a city, we had to get it right," she says. "We also distributed information to the taxi drivers to ensure there would be enough taxis in the right place at the right time." - The 2012 showcase featured a number of firsts: the first time in Liverpool; the first time an event app was launched; and the first Digital Day, an additional one-day conference.